Home › Dirty Politics › Where have all the Singaporeans gone? Where have all the Singaporeans gone? It has been more than fifteen years since I left NTU (then NTI), what left me drifted further from my alma mater as I am typing this email? Two mainland Chinese students were speaking besides me as I type on the NTU campus, the number of students walking past me for last one hour spoke mainly mandarin with strong mainland Chinese accents instead of Singlish which was common in the old days. Perhaps it is just coincidence that it is the Jun holiday when most local students have returned home. Many of the heads of department in NTU are now occupied by China-born lecturers and other “foreign talents”. Flipping through the NTU Alumni newsletter and I can see so many Alumni associations being setup in various main cities in China. Many lecturers and interviewees in the magazine are from mainland China. Actually more than the mainlanders, there were considerably big number of students from non-traditional sources such as Vietnam, Myanmar and India as well. There are also considerable number of researchers here spotted with silver hair (aka Caucasians). 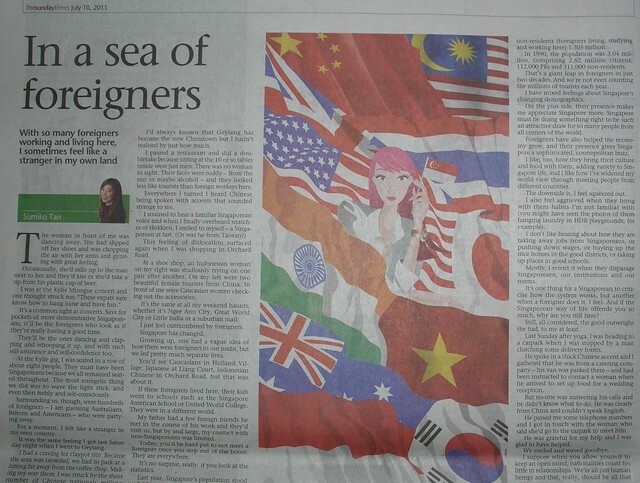 So what if NTU (and for that matters NUS) has achieved international recognition? I have no sense of belonging in this University anymore. Even the place has been turned upside down.The size seems to have tripled with so many new buildings being built over the last ten years. Where have all the Singaporeans gone to, I wonder? “Please allow me to highlight many observations from fellow singaporeans. When I take the public transport to work during peak hours, I see that the bus is occupied by 75% foreigners, and this happens every day. Not a few times, the whole upper deck of a bus is occupied by all China young men on trips other than working day peak hours. The same thing with the bus full of indians from india on work days. I have heard from the neighbours and read remarks from indians that they are here to fill the jobs that we singaporeans are ill qualified to do. They came mostly as IT workers first, then lawyers and finance and many others. China men have also proudly declared to us singaporeans that our dear government invited them to come produce children here! Instead of viewing each other with suspicion as their parents once did, Singapore’s Chinese, Indians and Malays have become intensely preoccupied with the ‘foreign threat’ to their jobs and earnings. THE current wave of migrant workers from China and India has had an unintended side benefit for Singapore, blurring differences between local Chinese and Malays. The new competition they introduced into the workforce has helped to get these once quarrelling races to put aside old discords and jointly face the common challenge. In the 60s and 70s, ethnic conflicts were a daily story in Singapore generally over who should get a bigger piece of the economic pie. Every issue seemed to revolve around race. The impact of globalisation and the mass inflow of foreigners are helping the Chinese and Malays achieve commonality faster than anything else. It has promoted a common bond – as well as a sense of nationalism – which would have been a lot slower without the 2,000,000 foreigners. In the latest example, Singapore’s Chinese majority rallied to condemn a Chinese migrant worker after he roughed up a Malay citizen and boasted about it online. Zhou Hou, a 24-year-old delivery worker, bragged in Facebook how he knocked down a Singaporean “because he saw me coming and did not give way” and calling Singa-poreans “retards”. It probably showed his cocky dislike for Singaporeans in general, rather than any particular race. Zhou has since deleted the post (with his photo) and made several apologies to Singaporeans, claiming it was done on the spur of his “frustrations”. With a history of ethnic riots, racial harmony has always been Singapore’s priority objective, something that not many new migrants from China and India are aware of. “Those retards who want to act ‘garang’ step forward. I come here not to be bullied or insulted – from a true noble Chinese with 5,000 years of cultural baptism,” Zhou wrote, with a tinge of ethnic superiority. If he thought he would be supported by the Chinese here he was wrong. Several Singaporeans immediately filed police reports against his remarks. Police are now investigating the case. Since independence, a new generation of Singaporeans – especially Chi-nese and Malays – have grown up and had gone to schools, lived and served national service together. The integration has stabilised things but race differences have never completely disappeared. In the early days, it was normal to see Chinese Singaporeans cheering football teams from China when they played here against Singapore which comprised mostly of Malay players. Once as a teenager, I watched some 8,000 local Indians rooting for a visiting Indian team against our state side. Singapore was then far from being a nation despite military service and years of National Day Parades. To the Malays, Chinese and Indians were taking their jobs away – and vice versa. Language, social norms and even food became contentious issues. But as foreigners flocked to our shores, Malays along with other races gradually became more preoccupied with the “foreign threat” to their jobs and earnings. Instead of viewing each other with suspicion as their parents once did, the Chinese and Malays have become more concerned about losing out to the foreigners . The Government had apparently opened the doors to so many mainland Chinese and Indians because it believed that they would be more culturally acceptable to the locals. The major question was whether the minority Malays would object to the inflow from India and China. As history turned out, the racial dimension to the immigration did not materialise because the policy was widely opposed by the vast majority of Singaporeans. When the Malays saw their fellow Singaporeans – particularly Chinese – were staunch critics, they were somewhat reassured that it was not a racial issue, said a polytechnic lecturer. “A race conflict could have happened had the local Chinese rooted for more immigrants from China and Singaporean Indians wanted more mainland Indians,” the academician said. But that never occured. On the contrary, the angriest condemnation of the influx of Chinese and Indian workers were the local Chinese and Indians respectively. It removed a potential racial sting when the minority Malays and In-dians found that they were not opposing the policy by themselves. I had noticed over the years that Singaporean Chinese were more vo-cal in condemning the policy than the Malays. The same applies to the local Indians against the inflow of job-seeking professionals from India. The Zhou Hou incident, sensitive because it touched on race, has shown how well Singaporeans have integrated. An online discussion on whether the Chinese here would help a Malay if he was assaulted by a Chinese mainlander produced a largely “yes” answer and the following sample comments. I am an ex-engineering graduate of NTU from the School of Electrical, Electronic Engineering. What the writer said is true. I saw it with my own eyes and heard with my own ears. No amount of government statistics can convince me otherwise. Tony Tan is responsible for one of the greatest policy errors that will cause great, untold harm to Singapore. His foreign-student policies have caused an entire generation of Singaporeans to lose loyalty for Singapore. Which citizens would not lose their feelings for the country if they are discriminated in the very country whom they have sacrificed 2.5 years of their lives under a humiliating military conscription. Some of the so-called foreign scholars were really mediocre. Even I got better results (2nd-upper honours) than many of them. Go and get NTU to open up their records. Ask NTU School of EEE to reveal how many so-called foreign scholars got 2nd-lower honours and below. It is a simple matter to verify. Several of so-called foreign scholars were lazy. Is this a surprise when government throw freebies and monies at them to have them to study here? Throwing free money is a stupid and wasteful way to attract talent. Talent no, parasites more likely. Some of them are really parasites. Throwing freebies and money around creates a fertile soil for growing parasites. You foreign scholars out there. You know who you are. Please pay back if you get 2nd-lower honours and below. I don’t mean just the school fees. Pay back the allowance you got for studying here too. As if the injustice wasn’t bad enough, several of the PRC foreign scholars went home because there were more opportunities back home. Nothing was said about them. Not a word. What happened when our Singaporean brothers broke their bond? They were publicly named and shamed by Philip Yeo of EDB. Why like that? Why so unfair? Why you punish your own people and keep a closed eye for the same crime? As a Singaporean, do you still feel like singing Mahjulah Singapura? You feel betrayed by the PAP whom we have voted in for decades. Tony Tan was the PAP minister who was responsible for all these injustice. I cannot forgive him for this. If you have been an ex-student (particularly engineering) of NTU/NUS, can you forgive him? Another complaint as an ex-NTU student in the School of EEE is the poor quality of foreign lecturers. Several of them can’t speak English. Why is it we students have to repeat a year of schooling if we fail the English language and yet we can have lecturers who cannot speak proper English to teach us while drawing 5-digit salary? Where is justice? I have to swallow injustice throughout my university days. This is not only unfair to the students who paid ever-rising school fees, it is also unfair to the Singaporean lecturers whom I felt were more devoted to teaching than the research-oriented failed-in-English foreign lecturers. We students pay our school fees for quality teaching, not quality research. Hello NTU/NUS, stop raising your school fees if you cannot even provide the basics – lecturers who can string sentences with proper grammar!! ‹ So have MM Lee Kuan Yew and SM Goh Chok Tong retired?